Wall painting found in Egypt, topic of video program about Pharoah Ahmose, now thought to be pharaoh in Exodus, which translated means "brother of Moses" in 1500 BCE. It used to be thought that Ramses had been the Pharaoh. The problem is that in the Torah the name of the Pharaoh is not given. Today's science has discovered genetics. From this we have found the Cohen gene that identifies the descendants of Aaron, brother of Moses. They were designated to be Cohens, men with certain responsibilities in their new religion. These were duties to be carried out in the Temple that would someday be built. Moses lived in c1391-1271 BCE, or earlier since researchers now believe that the Exodus happened in 1500 BCE. . Aaron was a little older than Moses. Aaron and Moses both were carrying the Cohen gene, identifying their Y dna haplogroup as J1. This should be traced back to their father, Amram, and his father, Kohath, and then Levi, Jacob, Isaac, Abraham, Terah, Nahor, Serug, Reu, Peleg, Eber, Shelah, Arpachahad, Shem, and finally-Noah himself. Therefore, Aaron and Moses were both from the tribe of Levi. Their ancestor was Jacob, who had 12 sons and Levi was one of them. Jacob fathered these twelve through 2 wives, Leah and her sister, Rachel. Each wife had a handmaiden who also bore Jacob sons. They were Reuben, Simon, Levi, Judah, Issachar, and Zebulun, sons of Leah; Gad and Asher, sons of Ziphah the handmaiden, Dan and Naphtali, sons of Bilhah, handmaiden, and Joseph and Benjamin, sons of Rachel. Joseph became the Vizier of the Pharaoh of Egypt and did not need to receive a portion of land, so Jacob gave his share to Joseph's 2 sons, Manasseh, who was Joseph's first son by Asenath, and Ephraim. According to DNA, all 12 of these tribal fathers should be carrying the J1 Cohen gene for their haplogroup. The 12 tribal fathers went into Egypt at a time of famine in Canaan and didn't come out till 400 years later. They had become very numerous and this caused them to be taken as slaves and kept until Moses was 80 years old and freed them by marching back to Canaan for 40 years where they established themselves again as their ancestor, Jacob, had lived there. All these people had been followers of one g-d, the G-d of Abraham, Isaac and Jacob. This distinguished them from other people of the period. They were also distinguished by circumcision, started by Abraham whose tradition was to do this to their male children at the age of 8 days. Two other sons of the group, Ishmael, first son of Abraham and Esau, son of Isaac and twin brother of Jacob, also carried on this tradition of circumcision, but at the age of 13 years. They had not followed their fathers but had parted from them to go their separate way. Moses, son of Jochebed, daughter of Levi, and Kohath, also a son of Levi, whose son, Amram, was the father of Moses, wrote the first 5 books of the Bible on his 40 year journey. Having been born in Egypt to slaves, he had been found in the bulrushes and adopted by the daughter of the Pharaoh, so was raised as a prince and was well educated. He could read and write among other skills. So he is credited with writing Genesis, Exodus, Leviticus, Numbers and Deuteronomy. He established the Mosaic Law and caused the men to be divided into Cohens who were direct descendants of Aaron, Levites for other direct descendants and the others who were to be called Israelites, for that is what Abraham's people were called when they came to the city of Ur, which happens to be in modern day Iraq. 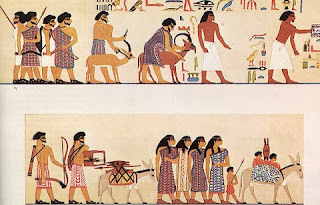 Today many researchers feel that these were the Hyksos that had been ruling Egypt and that the Exodus itself happened in 1500 BCE. We know that Abraham's Israelites came from the East. Cohen meant "Priest." His role was as the chosen holy instrument to mediate between man and G-d. Originally it seems that every Israelite family head was consecrated to serve as priest with the first-born son who was regarded as the inheritor of his father's house, a position of great power. This was maintained until after the Exodus when the first-born became suspect as a result of the Golden Calf incident. The tribe of Levi was selected in their stead. Most of the Levites were then employed in work connected with the Tabernacle where the family of Aaron became the actual priests responsible for sacrifices, the supervision of hygienic purity, and instructing the people in the Mosaic Law. The High Priest or Cohen was also responsible for divination through the Urim and Thummim. The tribe of Levi was excluded from having their own territory and they made their livelihood from contributions of tithing from the others. The priest received 1/10th of the Levites' tithe and also a portion of the sacrifices offered. The priesthood was hereditary and they were subject to strict laws regarding contamination by corpses and the choice of a wife. They wore distinctive clothing in prayer. To make sure they didn't all live in one area, but were dispersed throughout the territory, special cities were assigned to them in the territories of the other various tribes. These laws were written down before they ever took Canaan, and evolved differently when the Israelites settled on the land. Knowing you were a Cohen was handed down orally to the children in the family. The Levites were to be the teachers and helpers of the Cohens. It also is a hereditary position, as the Cohens are also. Each family of Levites was assigned specific duties connected with the transport and assembly of the parts of the Tabernacle in the wilderness which was later transferred to duties in the Temple. After the conquest of Canaan, the Levites were to teach the Torah to the people.. They received 48 towns they were to work in to cover all the territory, so they were traveling teachers. Sometimes this didn't always go according to plan. Ezekiel replaced the non-Jewish Nethinim with the Levite in his Utopian Temple plan but this never came about. The Temple service was organized by King David and the Levites were divided into groups, each doing some different job such as singers, instrumentalists, gatekeepers, assistants to the priests during the sacrifice, etc. Every group was divided into 24 sections, each serving for a week at a time. During the 2nd Temple period, the priests outnumbered the Levites and shared their tithe. The Levites were also to wash the priest's hands before the priests blessed the people. We have the 3 distinct roles today, and we see it in the synagogues. The Cohens are first to read from the Torah on Shabbat, the Levites are next, and then any Israelites may read to the congregation. There is also a time when the Levites are to wash the feet of the Cohen. Today we find that half of today's Cohens in the synagogue have the haplogroup of J1c3 or (J-P58), as the geneticists call it. 15% of the Cohens today belong to the haplogroup of J2a. This goes back a good 3,200 years to 4,200 years ago to Aaron or to his descendants who have morphed into J2 from J1. Ydna does mutate, and this could be what has happened to show a slight variation. That takes care of 65% of the Cohens who have actually descended from Aaron, proven through DNA testing. The Assyrians attacked the 12 tribes in 721 BCE and took away most all of 10 of the tribes. Knowing that the Exodus occurred in 1500 BCE, that means that these tribes had been living on land originally called Canaan for about 800 years already. What tribes remained were Judah, who had about 76,500 members and was the largest and strongest of the 12 tribes. Some Benjamites remained with them. Benjamin was the youngest son of Jacob and one of the smallest tribes with about 45,600 in it. Because the tribe of Judah was the main tribe remaining, many of them were also taken as slaves when the Babylonians attacked the weakened state in 597 BCE and again in 586 BCE and carried them to Babylonia where they met up with many former tribal relatives as well. We find that others had become scattered throughout the Middle East. Finally, Cyrus, king of Persia (Iran) conquered the Babylonians which included Judah and Israel's land. In 538 BCE he granted permission to the exiles of Judah living in Babylon to return to their homeland and rebuild the Temple. They thought of him as a Divine agent. Most did return and rebuild. So we find that from a huge amount of people numbering at least 603,500, the Jews, as they are now called from the name of the tribe of Judah, have been narrowed down to a few remaining ones, and in DNA language, this has produced a bottleneck population. What holds them all together? They all still share the belief in one G-d. They have not adopted the belief of the Assyrians or Babylonians of multiple gods. They all follow the Mosaic Law as laid down by Moses back in 1271 BCE, 733 years previously. After settling again the Romans arose in power and attacked Jerusalem, the capital of Judah and home of the 2nd Temple and burned both down in 70 CE. This caused another dispersion of the people. This time, some stayed in nearby cities and became known as the Mizrachim Jews. Mizrachi was the name of Egypt. Some went to nearby Rome as slaves, and then managed to be taken to France and Germany. They became known as the Ashkenazim Jews because their language, Hebrew, also added a lot of German words to it. Some managed to get to Spain, and became known as the Sephardi Jews, Sephard being the Hebrew word for Spain. They spoke Hebrew with a lot of Spanish words added. They also were driven to Portugal later. So we developed 3 different groups of Jews speaking Yiddish, Ladino, and Arabic with Hebrew added. Each group kept the divisions of Cohen, Levites and Israelites within the religious structure. Usually we add the Mizrachim to the Sephardim Jews and make it only 2 different groups that have been geographically divided, but not in religion. We find that 40% of the Sephardim Jews belong to haplogroup J1, the Cohen gene. Also, we find that some Arabs carry the Cohen gene. So we find that 35-43% of all Jewish men belong to the J haplogroup and its sub haplogroups. Ashkenazim share the same DNA with their Middle Eastern brothers. As a rule they do not share much dna with their non-Jewish population of Europe. You must remember that Judaism caused them to not mix with others. Eating would require that they eat with their own group as they kept kosher. That meant that they wouldn't eat the same foods. Meat had to be specially prepared and the animal had to be killed in a certain manner with certain prayers. Meat and milk were not eaten in the same meal together. There were these differences that Christianity found deplorable and why they didn't want to follow the Mosaic Law in the first place, so both parties, Jews and non-Jews, did not get it on, as they say, except in rare cases where there were no women to be had. Then they would have been taught all about Judaism to be proper mothers, because later on the fact that you were a Jew or not was decided if the mother was Jewish or not. We find that the men remained as the same group as their ancestors with Ashkenazim. It was with the women that you can find more interbreeding and mixing of mt dna than you will find with Sephardim. .
Ashkenazim also took in Khazaria's Jews. Khazaria, situated on the Silk Road, was a nation that was almost like a 2nd Jewish state. The Bulan or King converted to Judaism and so did his royal house. Others could choose it or not. They were free. Khazaria, a state that was part of southern Russia, existed in the 7th-8th century. They may account for the R1b found among Jewish Ashkenazim. Since when the state became part of Russia and many of the Jewish people joined up with others in eastern Europe, many Ashkenazim probably carry some genes of theirs as well. Today, Israel has 8,012,400 people. They started with 650,000 in May 1948 when they announced their acceptance as a state by the UN after the big vote. The 12 tribes numbered 603,500 at their highest count. Only 6,037,700 are Jewish, or 75.4%. The state of Israel was created as a refuge for Jews.Out of the Jewish population of some 6 million, 2,921,000 are Sephardim and Mizrachim. They make up 50.2% of the Jewish population of Israel. Ashkenazim number 2,767,000 or 47.5% of Israel's Jewish population. 70% to 82% of all the Jews share the same DNA haplogroups with Arabs. The last few thousand years show they have been sharing from the same chromosome pool. The current Cohens descended from a small number of paternal ancestors. The estimates of the coalescence time ( united into one time period ) also lends support to the hypothesis that the extended CMH ( Cohen Modal Haplotype) represents a unique founding lineage of the ancient Hebrews that has been paternally inherited along with the Jewish priesthood. Jews have been treated badly for the entire length of time since 70 CE and 6 million were killed by Hitler's Nazis in WWII. The beautiful thing about establishing Israel again is that it has brought the 3 branches of Jewish people back together. Today we see the intermarriage taking place between them. Though having to defend Israel from the very beginning is terrible, but the Army service has also meshed the three groups together as one. It has turned both men and women into warriors. Work has been going on to find the Lost 10 Tribes, and many have been added to the fold and brought back to Israel after the almost 3,000 years of being apart from each other. This is probably the most exciting and uplifting project going on. To find people who still maintain some quality of their long lost brethren and their faith brings joy to all our hearts. The beauty is that they have wanted to return. They have wanted to be a part of today's in-gathering. Carrying the burden of only accepting the one G-d has been difficult on Jewish population numbers as they haven't followed the crowd in their religious belief but have maintained their covenant to follow the Laws of Moses. Jews make up only 0.02% of the world population. We haven't been exterminated yet. Yes, we are up against another bottleneck, and pray to continue to live. What's been important to us in our religion has been what responsibilities we have. Are we Cohens, Levites or Israelites? Not what haplogroup we happen to be a part of. We are just learning that beautiful fact today, anyway. We are happily surprised to see that we have done so well, considering we started over 4,000 years ago by accepting G-d's Covenant. Much has happened to us since then. Just ask the population geneticists and historians. Am Yisrael Chi, the people of Israel live. http://www.simpletoremember.com/articles/a/cohanim-dna-connection/ Excellent, please read this. J2, which is believed to be associated with the spread of agriculture during the Neolithic Period from Anatolia, is found throughout central Asia, the Mediterranean, and south into India. Eastern Europe, Iberia and Germany. We are talking about the Y haplogroups of J, J1, J2 which arose 10,000 to 15,000 years ago in the Fertile Crescent including Jews, Arabs, Armenians and Kurds, found at highest levels in Iran and Iraq where it most likely originated and carried by traders into Europe, central Asia, India and Pakistan. A woman carries only the MT dna whereas the man carries both MT and Y dna. The J, J1, J2 MT line originated about 45,000 years ago in central Asia and connected with Neolithic farming and herding in Europe starting about 10,000 years ago. Common in Near East, Europe, Caucasus, N. Africa and Middle East and among Jews. J2 is more localized in the Mediterranean. We are not talking about the MT line for the Cohen gene; only the Y dna.